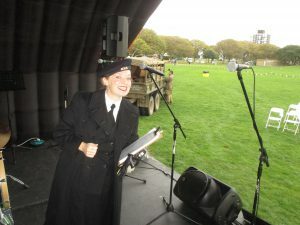 Singing for the Veterans at Southsea Castle and off to Milan! 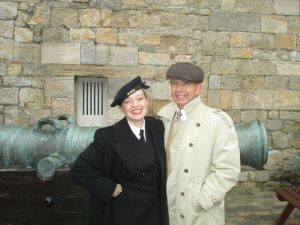 Paul and I at Southsea Castle! Hello every-one I’m back at my desk although I have to confess not for long. I’ve so much to tell you all that time is quickly running away with me and once again I’m burning the midnight oil. I can’t believe this Saturday Paul and I will be flying back out to Milan for Graffignana’s Vintage Festival. I still have my show plans to prepare and much to pack that I’m a little at sixes and sevens due to the fact my September has been non stop after performing 40 shows back to back which hasn’t given me much of a turn around. 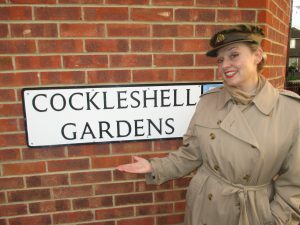 I’m also out everyday this week singing so I had better get typing and tell you the latest. Meeting Up After the Show for a Natter! who trained in Southsea. If you look and you can find references everywhere in the street names. For Paul and I our Saturday started bright and early at Castle field as I had been engaged to perform 3 x 45 minute shows daily. One WRNS, one glamour and one ATS. I had been looking forward to this job very much. I know many of the veterans personally due to the number of shows I’ve performed for them in France. 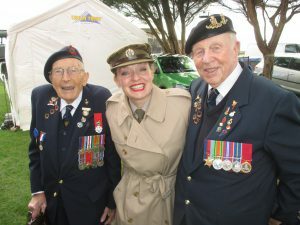 My first Normandy show was staged in the town of Ver-sur- Mer as part of the 60th D-day Commemorations in 2004 and I’ve been back every year since playing at different venues along the Normandy coast line. 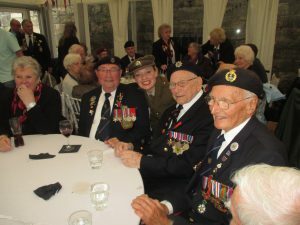 On this occasion I had concerns about the weather and sure enough no sooner than the speeches finished and it was my turn to step on stage the heavens opened and all the veterans retreated into the castle where they had tea, coffee, food and more importantly somewhere warm and dry to sit. I however played on regardless with “Rule Britannia” and “The Fleets in Port Again” to a sea of empty chairs and worms. What can I say the show must go on and I made sure it did for a few soggy re-anacters who were left on the field. 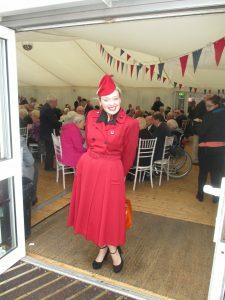 However by the time I was due to come back on stage for my second glamour set the rain had cleared away and we had been re joined by the veterans and The Red Devils who parachuted in. I’m also pleased to say the rain stayed away for my grand finally as I quickly changed into my ATS uniform and we finish the day in style with the Best of British before we were able to return to the castle for a hot cup of tea and a natter with the veterans . So a big thank-you to Mark and The Spirit of Normandy Trust who invited me and I hope it wont be too long before we all meet up again. All Dressed Up for My Glamour Set! I will have lots to tell you and many more photos to share with you all so Keep Watching. Paul and I fly out on the 7th October which is Paul’s Birthday and we fly back on the 10th which is mine so I’m looking forward to this next week very much. 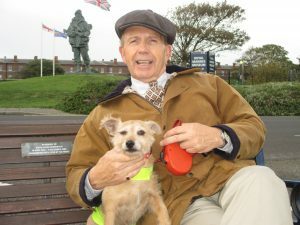 Paul and Poppy in Southsea!